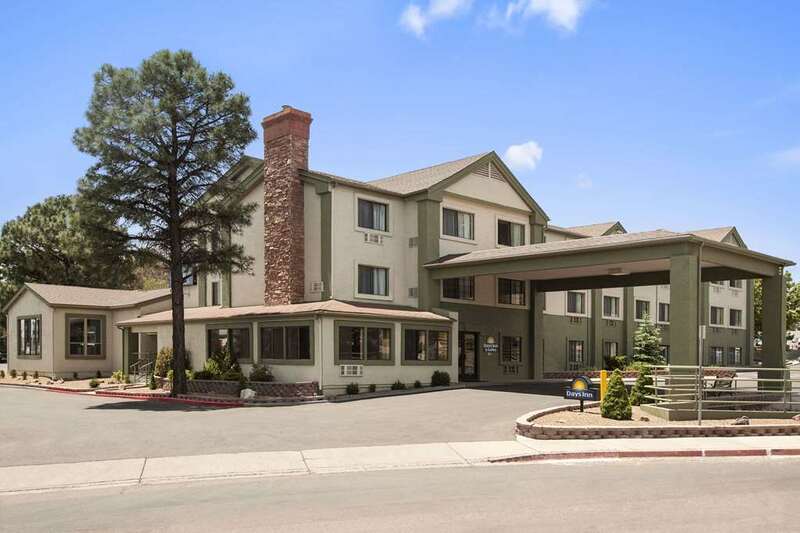 The Days Inn And Suites located in East Flagstaff, Arizona, is right off Interstate 40 at exit 201. Our Smoke Free, Chairman Award winning property has been given the highest rating by Days Inn Worldwide for superior quality and service. We offer a complimentary hot breakfast with a menu that changes daily, including breakfast items such as Belgium waffles, scrambled eggs, fried egg patties, sausage, and biscuits and gravy available every morning from 6am to 10am. Maximum 2 pets allowed in our designated Pet Rooms only, for non-refundable charge of 35.00 USD per night in pet-friendly rooms only. Pet Sanitation Fee is 300.00 USD if applicable. Note, hotel has limited availability of pet friendly rooms and cannot guarantee a pet room available at check-in without pre-reserving these type rooms. ADA defined service animals are also welcome at this hotel. Room accommodations feature free high speed internet, local telephone calls, guest laundry, business center and indoor heated swimming pool and spa. Inquire about Wyndham Rewards, Days Inns free travel rewards program where you can earn points redeemable for hundreds of rewards, just for staying at one of our more than 6,000 locations around the globe. We are centrally located in Northern Arizona to many tourist attractions including Grand Canyon National Park, Petrified Forest, Wupatki National Monument, Sunset Crater, Walnut Canyon National Monument, Lowell Observatory, Oak Creek Canyon Sedona, Arizona Snowbowl, and much more. Come explore Northern Arizona, weather on vacation, a reunion, family get together, retreats or business use us as your home away from home for your Arizona sightseeing. Ask about our full day guided Grand Canyon Tours, includes park entry and lunch. Our tours include pickup and drop off right from the hotel.